According to a recent CREB report, a total of 2,813 units were sold within the Calgary market during the month of June. While this represent an 18 percent year-over-year decline for the month of June, it is still an improvement when looking at the five year average. While consumers were initially concerned by possible price declines within the market, these anticipated falls have failed to occur. In fact, the city-wide benchmark reached $455,400, which represents a monthly gain of 0.29 percent and a year-over-year increase of 0.13 percent. While city-wide prices have remained stable, activity can vary greatly depending upon the price range, property type and community. Therefore, it is essential to examine the unique features of each property when determining an appropriate value. In addition to seeing a stabilization in prices, new listings reached 3,122 units during the month of June. As such, the Calgary market is experiencing downward pressure on inventory levels with the months of supply remaining balanced at 2.3 months. Meanwhile, year-over-year sales activity fell from 32 percent in the first quarter to 22 percent in the second quarter. 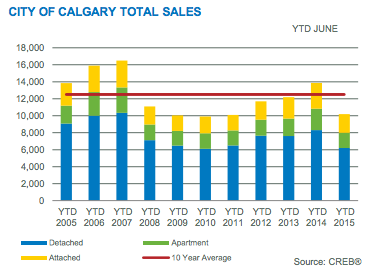 Overall, sales and new listings have slowed for all property types within the City of Calgary housing market. Among these, the apartment sector has experienced the weakest absorption rate. These weaker rates have started to have an impact on prices, with the second quarter benchmark price being 0.81 percent below last year’s figures and 0.93 percent below first quarter figures. Unadjusted apartment averages also continue to be fall 1.65 percent below last year’s figures. Benchmark prices are slightly better within the detached segment, with prices totaling $515,500 in June. This represents a 0.4 percent increase over last year. On the other hand, the year-to-date benchmark price for detached properties remained at 3.44 percent above last year. Meanwhile, the year-to-date average fell to 2.26 percent while the median detached home price fell by 1.54 percent. Overall, the Calgary housing market is showing signs of stability. It is important to note, however, that there are still several risk factors that could have an impact on the health of the market during the second half of the year. Mckenzie Towne is a community located in Southwest Calgary. It was developed in 1995 and has grown to be a highly sought after place to live. McKenzie Towne was hand-picked by the Urban Land Institute as one of the top twenty six master planned communities in the world! McKenzie Towne has all of the amenities of a neighborhood that's been around for a long time, paired with the trendiness of a city. Amenities include "High Street" with abundant stores, eateries and services. Also here are colleges, a personal residents' club, abundant water and park areas and much more. McKenzie Towne makes day to day living very enjoyable as it balances the beauty of nature with elegant urban design. 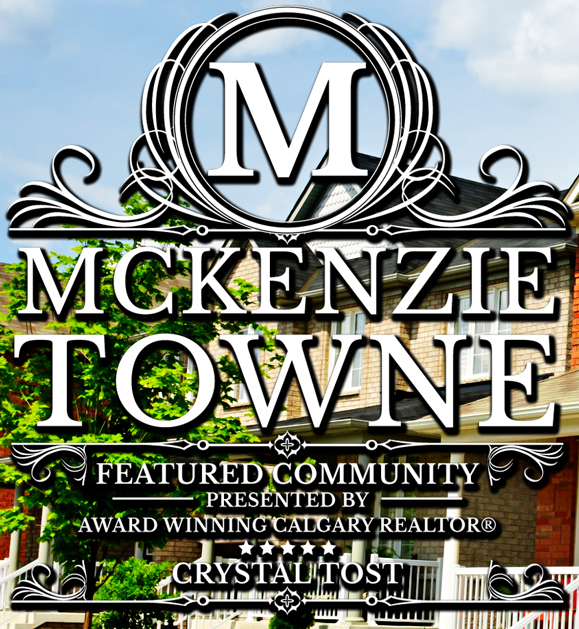 View Mckenzie Towne Calgary homes for sale along with in-depth information on McKenzie Towne, Calgary and its real estate market.